This program is geared to the youngest skaters. Skaters will learn to stand and balance. Once confident they will learn forward and backwards movement. Skates (figure skate or hockey) must be sturdy and lace up kind is preferred. CSA helmet is required (no bike helmets). $40 SKATE CANADA registration fee will be added to program registration fee. The buyer is able to use the cards for personal use or sell at full purchase price to recuperate their cost. *the program ages are suggested only. All ages are welcome based on ability and maturity. If you are unsure which program your child should join please consult a LSC board member or coach. This program teaches the fundamentals of skating, skaters learn balance, movement and agility on the ice. This program is the best start to all skating programs including hockey, figure skating, ringette and speed skating. Skates (figure skate or hockey) must be sturdy and lace up kind is preferred. CSA helmet is required (no bike helmets). Each registration must be accompanied by a fundraising deposit cheque dated Feb 1/19 for the amount of $400.00 Once fundraising requirements have been met your cheque will be returned or destroyed. If you wish to forego all fundraising commitments in lieu of cash payment you can date your fundraising cheque for October 1, 2018 and will be deposited at that time. A fast paced power skating program with Skate Canada certified coaches. A great addition to any hockey or ringette program as skaters will learn great skating skills to enhance their overall performance. There are no fundraising commitments for this program. This program is a continuation of the regular CanSkate programming and allows the skaters to continue their skills and begin to develop power and speed working through Levels 5-7. In addition to agility, balance and control, the artistry of figure skating elements are also a focus. Skills are taught in progression and skaters progress at their own pace. Skaters will have group or semi-private lessons with professional coaches. These lessons will occur within the scheduled Pre-StarSkate ice time and are booked with and billed directly from each coach. The buyer is able to use the tickets for personal use or sell at full purchase price to recuperate their cost. Each registration must be accompanied by a fundraising deposit cheque dated Feb 1/19 for the amount of $500.00 Once fundraising requirements have been met your cheque will be returned or destroyed. If you wish to forego all fundraising commitments in lieu of cash payment you date your fundraising cheque for October 1, 2018 and it will be deposited at that time. Primary skaters have completed all CanSkate levels and are working on their Preliminary and Junior Bronze Freeskate, Dance and Skating Skills. Intermediate skaters are working on Senior Bronze and Junior Silver levels of the StarSkate program. Skaters will have semi-private or private lessons with professional coaches. These lessons will occur within the scheduled Primary/Intermediate StarSkate ice time and are booked with and billed directly from each coach. Each registration must be accompanied by a fundraising deposit cheque dated Feb 1/19 for the amount of $500.00 Once fundraising requirements have been met your cheque will be returned or destroyed. If you wish to forego all fundraising commitments in lieu of cash payment you can date your fundraising cheque for October 1, 2018 and it will be deposited at that time. Senior skaters will have achieved Senior Silver or higher level. These skaters are pursuing recreational and competitive competitions. Senior skaters will learn freeskate, skating skills, dance and interpretive disciplines with a certified professional coach. Skaters will have private lessons with professional coaches. These lessons will occur within the scheduled Senior StarSkate ice time and are booked with and billed directly from each coach. Each registration must be accompanied by a fundraising deposit cheque dated Feb 1/18 for the amount of $500.00 Once fundraising requirements have been met your cheque will be returned. If you wish to forego all fundraising commitments in lieu of cash payment you can date your fundraising cheque for October 1, 2018 and it will be deposited at that time. Synchronized skating is a specialized discipline of figure skating. With 8-16 skaters on each team performing choreographed routines to music as one unit. Synchronized skating focuses on the accuracy of formations by combining the artistry of figure skating with the execution of circles, blocks, lines, wheels, intersections, creative and no hold elements in unison to music while demonstrating quality edges, power and flow. Skaters will learn a choreographed competitive program while enjoying a fun team dynamic. The team will compete at (2) competitions and local skating carnivals throughout the season. All weekly coaching and ice fees are included in the registration cost. Costuming, accessories and competition expenses may be extra. Team fundraising will be separate from club fundraising. For more information please contact lscinfo@lloydminsterskating.com and your information request will be forwarded to the team manager or coach. Skaters must be 18 years of age on or before July 1, 2018. No synchronized skating experience required. Skaters must be confident with forwards and backwards skating, mohawks and crossovers each direction and skating within close proximity to other skaters. This team is comprised of adults looking to continue with their passion for skating. Skaters will learn a choreographed competitive program while enjoying a fun team dynamic. The team will compete at (1) competition and local skating carnivals throughout the season. 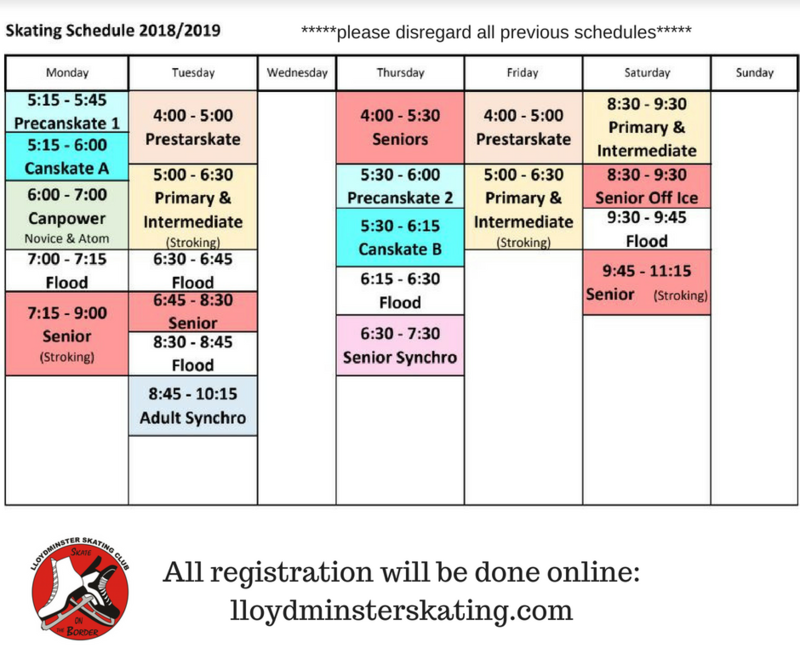 For more information in regards to schedules, fees and fundraising for adult synchro please email lscinfo@lloydminsterskating.com and your information request will be forwarded to the team manager or coach. Available to all StarSkate level skaters not currently enrolled in a LSC StarSkate program. $40 SKATE CANADA registration fee must be paid prior to purchasing a Drop In Punch Pass. Drop in pass must be presented to a LSC board member or coach prior to the skater entering the ice surface. Coaching and associated costs are separate and organized by the skater and coach. For additional information or questions please contact lscinfo@lloydminsterskating.com and a volunteer member of our board of directors will get back to you at their earliest convenience.